The skilled and experienced developers of a reputed Website Designing Agency in Phoenix AZ have laid down steps to convert a website into an android application using Android Studio. They say that if you are seriously on the lookout for a way to convert a website into an Android mobile application, then you are certainly not alone in this search. With the increased availability of smartphones and internet connection, customers these days rely more on their smartphones for carrying out day-to-day shenanigans. This increased mobile dependence has geared small as well as large Multi-National Corporations (MNCs) into taking their business mobile. Those who are still not harboring the endless potential of the mobile, then they are definitely missing out on large business opportunities. If you are still not convinced with our train of thought, then just consider this, almost two decades ago when websites were sneaking their way into the lives of small business owners, websites played a very important part in helping businesses garner huge traffic, increased sales and astonishing profits. Today, having a website is considered a key factor in a small business’ success today. So, what was once a trend has now become a full necessity. Don’t you think the same is applicable to mobile apps? We strongly believe it is. The skilled website and mobile developers, as well as the seo experts of a high acclaimed agency in Seo Services in Phoenix Arizona to help businesses stake out their own spot in the mobile frontier, have put together steps to convert a website into an android application using Android Studio. Just take in these steps, follow them step-by-step and you will be ready with a fully functional mobile application. There is an element which is used if you want to structure a web application (or just a web page) as a part of a client application, which is WebView. WebView is actually an extension of Android’s View that enables mobile developers to have the full view of the web pages as a part of their activity layout- XML(layout) file or Java class. Step 1: The first and pretty obvious step is to take a responsive website that you want to convert into a mobile application. The thing you have to make sure is that the website you are choosing should be fully responsive (mobile friendly) website. Here we are for the sake of explaining the whole process to you taking a hypothetical example of our own website www.websolutioncentre.com to convert into an android application using WebView which is a Mobile responsive site. 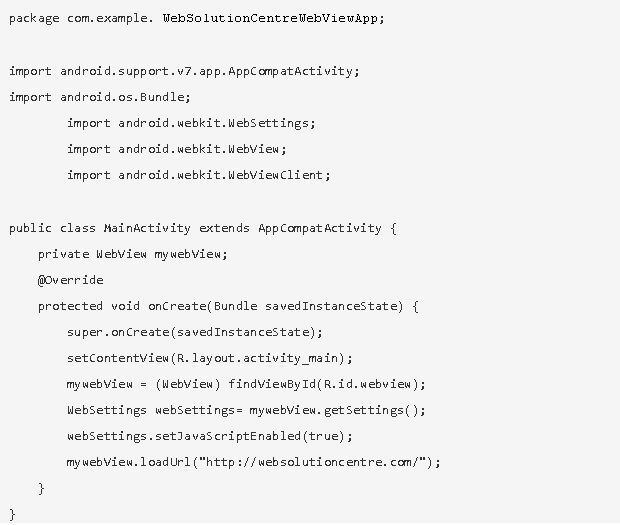 Step 2: Start with creating a new project in Android Studio and name it WebSolutionCentreWebViewApp. Step 3: Now open res →→→→→ layout →→→→→→ activity_main.xml (or) main.xml, create the interface of the application and then incorporate webview element to it. Step 5: Now you have to grant internet permission to the xml file. 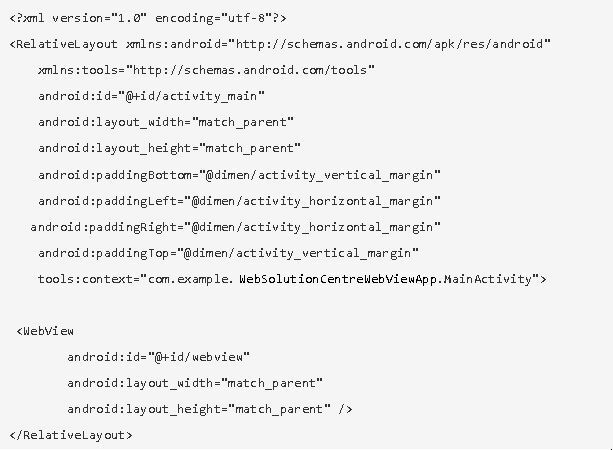 For this Open AndroidManifest.xml file and to it add internet permission just after the name of the package. This step is important to carry out as it will let the App load data directly from the website. Step 6: After adding the internet permission to the application, the application is complete. But you will witness one minor glitch that the application will open the links in the browser and not in the application itself. The way to rectify this problem is to add a line of code in your MainActivity.java class. Step 7: Now your application needs some back buttons, for this, you have to add this line of code to your MainActivity.java class. 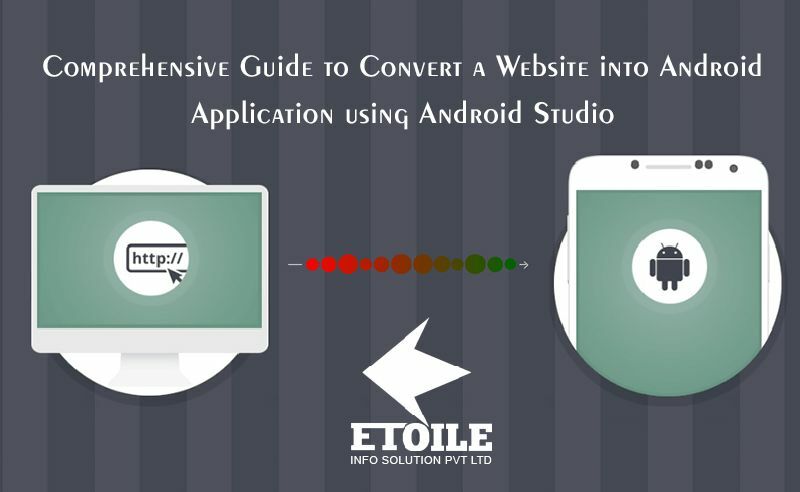 I hope this blog will be able to help you understand how you can easily convert your website into a mobile application using Android Studio. Do let us if you find this blog useful by simply leaving your comments in the comment box below. 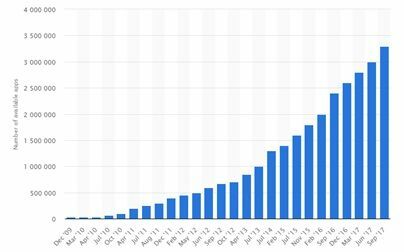 The mobile app developers of a renowned Phoenix Web Design Company start with this simple Statista statistic, “There are about 2.2m apps on the Apple App Store in January 2017 and 3.3m of them on Google Play in September 2017” and we are pretty adamant about one simple logic that these figures are surely going to skyrocket in the future, not the other way round. If you don’t believe us, then there is a graph to prove what we are saying. Have a look. But why people should choose your app to download and not so many others in the Apple Store or Google Play store. There has to be a solid reason or the value you are providing the customers through your app that will motivate them to download your app and use it on a daily basis. But for people to judge your app they need to be aware of the fact that your application exits in the Google or App Store in the first place. With so many applications already gracing the Apple and Google App Store, it becomes quintessential for people to increase their app’s visibility among all these competitors. In the most practical of ways, there are two ways of how people will know of your app and install it on their mobile phones in the first place. First, through advertising, be it online or offline or any sort and second is directly searching your app on an app store. The mobile app installs that are the result of the app store’s inbuilt app search module are known as organic app installs. The mobile app developers of a renowned Website Designing Agency in Phoenix AZ feels that if you are leveraging the full potential of organic app installs, then you are greatly losing out on a large chunk of valuable app users. Organic app installs are vital to the success of your brand’s mobile application since these installs are made by customers with a clear search intent that they know about your mobile application, they feel that your application is tapping in the huge need gap and they want to download it. This isn’t the case when they see your app advertised, because that time they don’t feel they need your application or if you are targeting any need. Organic app installs ensures a higher quality customer relationship from the first point (app search) to the last (app install). 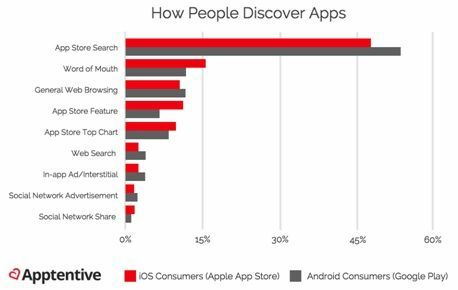 So, the point we are trying to put here is that discoverability plays a huge role in determining the success of a mobile application. That is why App Store Optimization abbreviated commonly as AOS is the great and the only way to make your presence felt in the crowded app store. Since we are going to discuss the various AOS trends for 2018, let’s first refresh our memory as to what App Store Optimization is? What is App Store Optimization (AOS)? The App Store Optimization or (AOS) is a part of search engine optimization that ensures your app is going by the app ranking criteria and is securing the first place in the Google Search Engine Result Page (SERP). App Store Optimization (AOS) is a great way to boost your ranking on Google Play Store and Apple Store. It ensures that you are having all those features and qualities that are enough to outrun your competitors in the race of app store traffic and app downloads. But the real question here is how online marketers get on the task of optimizing apps for better discoverability and visibility in an app store? 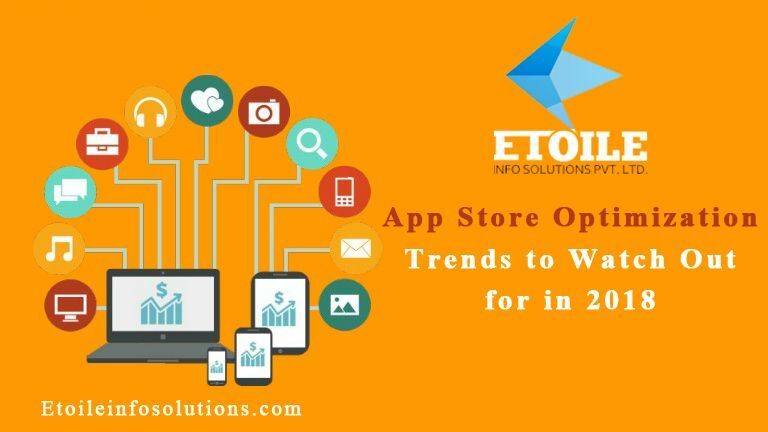 Etoile Info Solutions has put together several app store optimization techniques that will help you up your mobile app game in 2018. The major aspect for securing a top position on App store search rankings is by selecting the right app store keywords. But, don’t go about putting only the popular app store keywords just to be ranked higher on app store search. Chose keywords that are relevant to your app. Also, I don’t know how many people are aware of the fact that the words in the user app reviews are also indexed by the app store search engine. That’s why for quality and effective app store keywords, review mining is a great technique. 4.If you are launching a new app then use app store keywords with low difficulty and reasonable popularity. 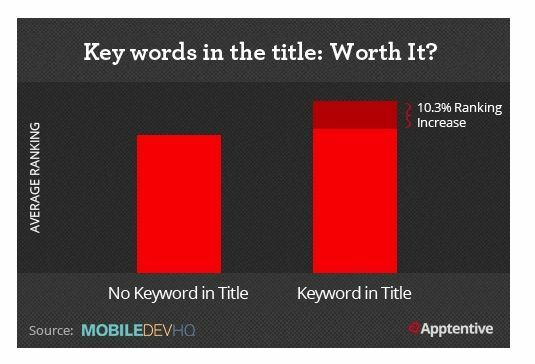 After an initial momentum, use app store keywords with higher popularity and reasonable difficulty. The next in queue is the app name which must be decided considering all the keywords you have finalized. According to a study, “using keywords in your title can result in up to 10.3% increase of rankings.” Google, as well as Apple’s app search algorithm, look for keywords in the app name when a user puts in an app store search query and give higher priority to those apps that contain the words similar to the search input. Use your brand name in the first, no rocket science, followed by few vital keywords separated by a dash or a semicolon. It is obvious that if you are instilling app store keywords in your app name and tile, the app description must also be loaded with it. But don’t go overboard with keyword stuffing, because that will cause app store search engine to penalize your app instead of ranking it. 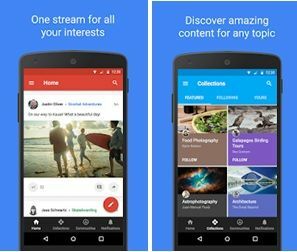 Google app store search engine does take into consideration keywords and pulls them from your description to be your app store keywords. Incorporate them sensibly so that they can go seamlessly and naturally with the app description. iOS App store search engine does not take into consideration the keywords you have incorporated in the app description. But that doesn’t mean you can let go of the app description game altogether. iOS wants online marketers to be detailed with the app description, what it does, what value it is providing, features, advantages, social proofs, awards, and honorable mentions your app has received. Read Also: What to keep in mind while hiring an SEO service provider? Both Google and iOS evaluate the names of In-app purchases (IAP) and index them in the app store search. 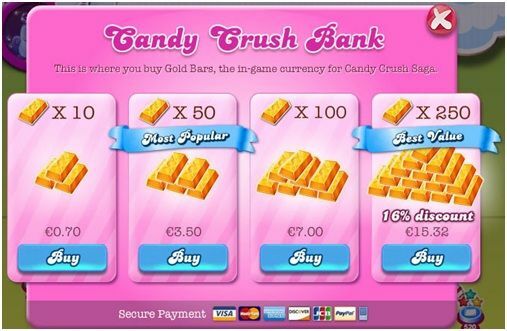 Your mobile applications’ In-app purchases should be app store keyword optimized, should have their display names, promotional images, and descriptions. You can display a maximum of 20 IAPs on your product page. We have an interesting statistic to match this point too. A great and impactful app store icon can increase downloads by up to 560%. Keeping the purpose of your application in mind, design a simple, creative yet eye-catching app icon that can tell all about your app in a single square icon. Color, shape and the frame you are using also plays a vital part in increasing your app downloads. The screenshots of your app play a major role in telling the users what the app is about and what all features it boasts. According to a study, using at least two best screenshots of your app can boost your conversions by up to 25%. Every screenshot you are using should portray a different feature of your app and what all users are going to get upon downloading it. Just make sure you are keeping your screenshots in a vertical position since they are easier to see on the narrow screens. 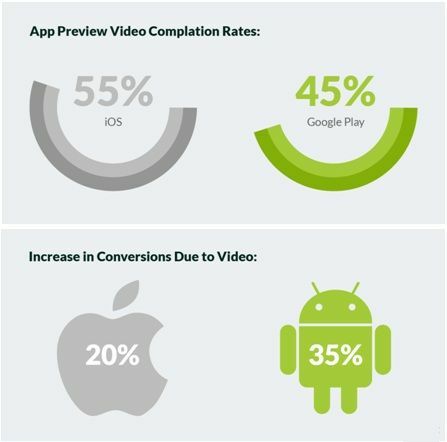 Though making a video is quite time-consuming and expensive, it can increase install rates by more than 20% in the Apple App Store and by 35% on Google Play, according to StoreMaven. 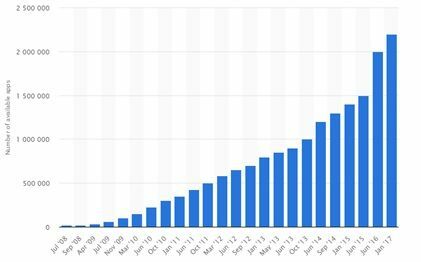 I hope these app store optimization (AOS) tips will help you to increase your app downloads in 2018. If you have more tips and suggestions you want to recommend leave your comments below.